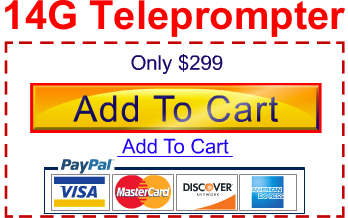 A teleprompter is a device that displays any sort of text for a speaker or performer. This is usually out of the audience’s sight to maintain a professional image. The teleprompter displays words right in front of the camera lens or in front of the audience, making it look like the person speaking has memorized what they were going to say or are speaking without any sort of script whatsoever. Because of where the teleprompter sits, the speaker looks directly into the camera or at the spectators, making them look confident and focused on speaking to their intended audience. The central piece of the teleprompter is a sheet of beam splitter glass. This glass is angled within the teleprompter and then surrounded by dark plastic or fabric to essentially darken the glass and create a reflective surface for the script. 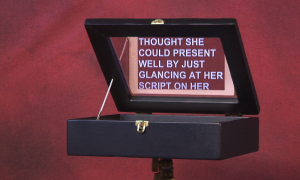 The original source of the script is on a small computer screen positioned at the bottom of the teleprompter, facing up onto the sheet of glass. The words then reflect off the angled piece of glass, which the speaker will read without cluing the audience into the fact they’re reading a script. Because the words are mirrored from the original screen, the script would need to be reversed so the presenter isn’t staring at a mirrored jumble of backwards letters and words. The device used to produce the script should also be capable of scrolling through the lines at an appropriate and consistent speed. Also, since the reflection is on the front of the glass, it won’t show through to the other side. If a camera is involved, there will be absolutely no lettering on the camera’s side of the glass, making it easy to film. It’s much like how the sun reflects off the front of a window at home, but you don’t see the same reflection from the inside. This is how the speaker is able to speak directly to the camera while reading straight off a script. Teleprompters are highly useful devices, but can also vary in quality. This is most often due to the software used for the actual composition and display of the original text on the computer screen. There are some programs that help make the script as readable as possible and others can help control the speed at which the text is scrolled through. The actual process of scrolling through the script can also be done manually, which may work better should there be a need for some sort of pause, like an unexpected reaction of the audience. If you’re tired of flipping through cue cards or rustling papers in hurried desperation to get to the next page, a teleprompter might be your best solution. It’ll help you maintain a professional and confident appearance, providing clear lines in just the right spot. Teleprompters can either be arranged to sit directly in front of a camera or sit on either side of a pulpit, depending on the situation. Either way, they help eliminate the inconveniences of their papery alternatives.